So, I cannot take credit for this Calendar idea. Somewhere many years ago, during our time in Montana, I must have come across some article that changed my organizational life ever so hugely. At that time we had two toddlers and a wee one, and my calendar was becoming a mass of scribbled black pen. The tip is this: Use a different color pen for each person in your family. That way, when you glance at the calendar for a certain child's doctor's appointment/sporting event/field trip, your eye is immediately drawn to just their activities. Basically, instead of a mass of scribbled black pen, my calendar is now a mass of scribbled colored pen. SOOOO... not only does it keep me more sane when trying to see who has what activity when, it also brings more cheer into my life! Wow. Double WFMW whammy. Yes, I'm THAT good. Each child has their favorite color. This also helps them pick out their own activities, lessening the, "Mom! When do I have *fill in the blank* again?" (Note: I said lessening, not eliminating.) Taylor is blue, Jordan is orange, Brit is pink, and Ian is green. I went with red. Family activities are in black, which happens to also be Nate's color. He doesn't have many of his own activities, and when he does we all come anyway. Poor man. This tip works extra well on Saturdays when all four children have soccer games at different times/fields. Because I know posts are always better with photos, I will show you our September. Yes, there are spills. Yes, there is whiteout. Yes, I have not-too-great handwriting. Yes, sometimes I grab a regular blue ball point pen. But, I'm just a glutton for making public my cobwebs and general messiness. Then again, we're all normal. We just try to hide most of the time behind the Miss Almost-Perfect mask. 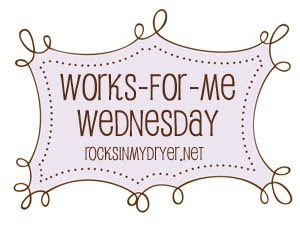 To check out more awesome Works For Me Wednesday tips visit Rocks In My Dryer. Great tip! I use Outlook on my computer, but I keep each family member's appointments in their own color and it works really well. I personally have settled on a weekly desktop calendar ( I need more space than a monthly would allow!) but I'm loving the color coded idea! Thanks for the tip! When you come visit Bethnay and I here is beautiful Sassy San Diego please use the RED marker. Can red be my color too? I still use a calendar that I carry in my purse. Now that the kids are involved in more activities I am learning to write really tiny. I like the color-coding idea!